I rarely breed, I do not breed to supplement my income, nor do I breed to make money. I have this breed because I adore them and cannot imagine life without them. Breeding is something that needs to be given serious consideration and should not be done without first considering the health and wellbeing of the breed. This is why I choose to health test before I consider breeding, eyes are checked by an eye specialist @ Animal Eye Care, hips are x-rayed and sent to be graded by approved AVA specialist, patellas are checked by my vet and graded, hearts are also checked by my vet. I have my dogs MRI’d and graded for CM/SM (Chiari Malformation & Syringomyelia) this is normally done by two specialists, one here in Australia and one in the UK. After health testing the Dam, when choosing a suitable Sire I look for one who has also been health tested, for type, temperament and preferably an outcross, as we need to expand our gene pool as much as possible. Stud fees vary and can be between $1,000.00 to $2,500.00 for a health-tested dog. 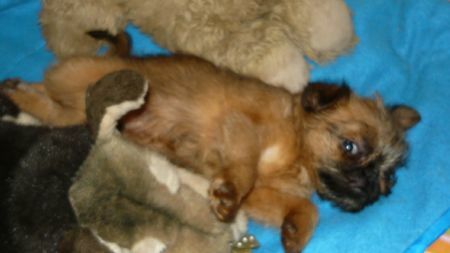 Puppies sell for anywhere between $1,200.00 to $3,000.00 depending where you get your puppy. Litter sizes vary anywhere from 1–7 puppies, with 2-3 being an average size litter. Our puppies are reared in a loving home environment, creating friendly well socialised puppies. Our dogs are never kennelled and live with us as part of the family coming and going through their doggy door. I am very selective as to where I home my puppies and have a very strict criteria. I need to make sure that any puppies I breed are going to the best possible forever homes and ensure that any new griffon owners are aware of their lifelong responsibilities for pet ownership. I also offer ongoing support and am more than happy to mind any puppies/ dogs I have placed should the need arise. I like to know how my puppies are going and like to keep in touch, I hold regular griffon gatherings that are great fun for the dogs and their owners. I have made many lifelong friends over the years. If you have your mind made up and it is definitely a Griffon you want, then contact registered breeders with the Canine Controlling Body in your relevant state, ask questions, and be prepared to be asked lots. You need to be comfortable with the breeder that you are getting your puppy from, as do they with you. If they don’t ask you questions, then I would be wanting to know why it is they breed? Visit them at their house see how they care for their dogs, if possible see the sire and the dam. Ask if they know of any health problems in the breed, if they health test, what support they offer. If they respond with “they don’t have any health problems”, I would be asking how they know if they do not test. How long they have been in the breed and why? How many of the puppies they have bred are they still in contact with? All puppies must be registered with the controlling body in the state they are bred ie Dogs Victoria, Dogs NSW etc and must be micro-chipped by law before going to their new home. Your new puppy should also come with an information pack which includes details on their vaccinations, worming, diet and care instructions. I also include some photos and enough food for a week to ensure that they do not have an upset tummy due to any change in their diet. Remember don’t make any rash or rushed decisions, if doesn’t feel right then it probably isn’t.